← A Break in the Status Quo: Could North Korea be Referred to the ICC? Things were supposed to settle down earlier this week when opposition activists in Kiev accepted an amnesty in exchange for vacating government buildings. Within hours, however, a new spate of violence broke out. Estimates vary, but it appears that about 20 protesters and 10 police officers have been killed in clashes this week. As the international community scrambles to address the ongoing violence, the numbers of dead and injured continue to grow. The European Union is now considering the imposition of targeted sanctions against the Ukrainian government for what they described as “unjustified use of excessive force by the Ukrainian authorities”. Russian Prime Minister responded by declaring that the Ukrainian authorities should not be a “doormat”, a statement widely interpreted as supporting the government’s crackdown on protestors and activists. US President Barack Obama has also intervened, calling for a “transitional government”. He also attacked Russia for supporting the Ukrainian government’s crackdown on protestors, drawing parallels to Moscow’s support for the Syrian regime of Bashar al-Assad. For the moment, there is far more rhetoric being strewn about than concerted action to end the violence. But a question that is almost certainly going to be asked with greater frequency in the coming days and weeks is whether the situation in Ukraine should be investigated by the International Criminal Court. Importantly, despite numerous statements that it supports international criminal justice and would join the ICC, Ukraine is one of the few European states which is not a member of the Court. As a result, the Court can only investigate alleged crimes in Ukraine if the United Nations Security Council referred the situation in the country to the ICC. Of course, any discussion of a referral would once again pit Russia against European Union members of the Council, a battle which could easily end in stalemate. Broadly speaking, Russia supports the government and has gone to lengths to paint the opposition as “extremists” and even “terrorists”. They have blamed the “West” for encouraging protestors and sowing dissent. The European Union (EU) is widely seen as sympathetic to the opposition activists who are, by and large, supportive of greater integration with the EU. This is undoubtedly an over-simplification. Some believe that that “this is now an internal, Ukrainian conflict” and “the proxy Russia v EU element seems to have receded.” But the division of international positions on Ukraine have been in place since at least the country’s 2004 Orange Revolution when Russia backed the Presidency of Viktor Yanukovych while the European Union threw its support behind Western-leaning Viktor Yushchenko. Given these tensions, getting the Security Council to refer the situation in Ukraine to the ICC would thus be immensely difficult – but perhaps not impossible. If all sides truly believe they are in the right and that the parties they support are innocent, they could agree to have the responsibility for violence adjudicated by the Court. That being said, it seems rather clear that, where their interests are at stake and they have taken firm positions in support of one side over another, major powers prefer that no party to a conflict is investigated over the investigation of all parties. Of course, they may also simply not trust the process or they may conclude that it would be deleterious to have the ICC involved when the situation remains fragile and a negotiated settlement to ongoing violence – in combination with an amnesty – is their preferred option. Notably, major human rights groups have remained silent on the question of the ICC. 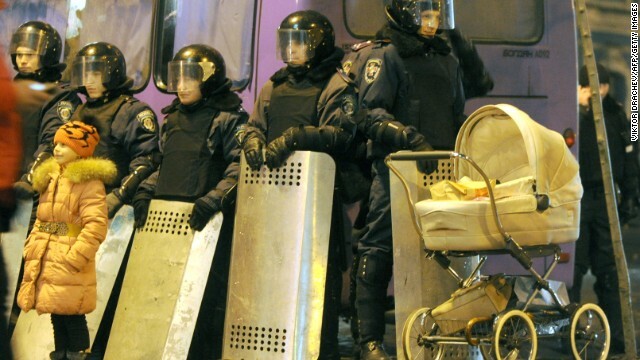 Amnesty International has called for an “end to impunity” for Ukrainian police. 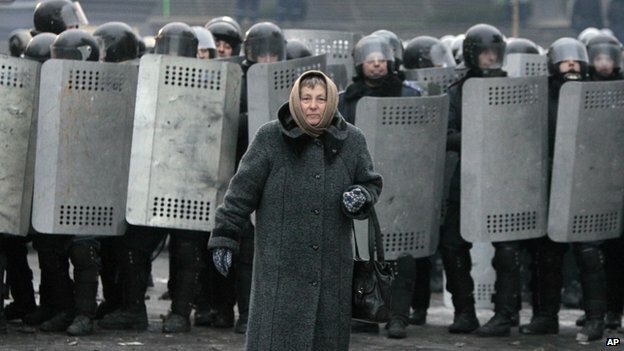 Human Rights Watch’s most recent statement likewise demands that President Yanukovych put an end to “police impunity”. To date, neither have thrown their support behind an ICC referral. But if the situation continues to deteriorate, that could change very quickly. For the Court, an intervention into Ukraine would be unique. Not only would it get the Court “out of Africa” but it would mark its first investigation into the conduct of what is ostensibly (if very precariously) democratically elected government. Given harassment of reporters, it could also mark the first time that violence perpetrated against journalists featured centrally in an ICC investigation. Still, the current level of violence and death may not (currently) satisfy the gravity threshold required by the Court’s Prosecutor to investigate allegations of an atrocity crime. As and if violence continues, however, this could change. Moreover, it remains unclear what, exactly, gravity means to the Office of the Prosecutor. Notably, it has rejected the view that gravity is simply a numbers-game of counting body-bags. It may be premature to talk of an ICC intervention in Ukraine. Clearly, a number of key obstacles remain. But this should not preclude collecting of evidence for a potential investigation in the future. In the case of Syria, which also would have to be referred to the Court by the Security Council, investigators have collected evidence which could eventually be used to prosecute those responsible for war crimes and crimes against humanity. 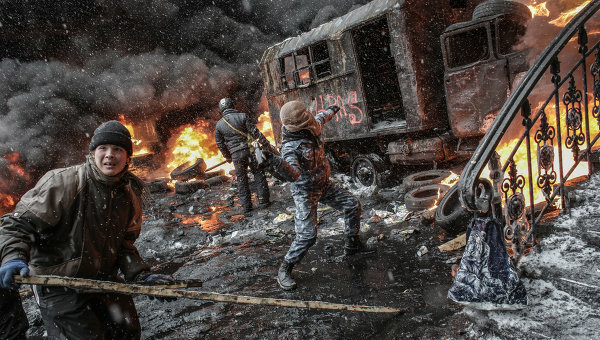 If violence continues, the same could – and indeed should – happen in Ukraine. This entry was posted in Europe, European Union (EU), International Criminal Court (ICC), Russia, Ukraine and tagged Viktor Yanukovych. Bookmark the permalink. 2 Responses to Should Ukraine be on the International Criminal Court’s Radar?